Peter Kirstein is the man who put the Queen of England on the internet. In 1976. 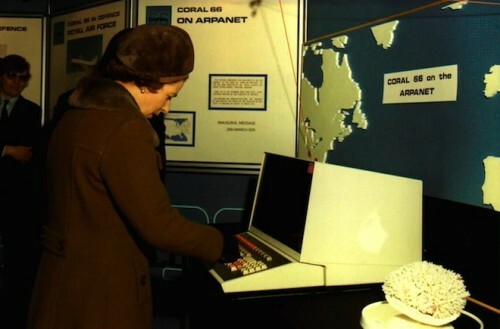 That’s Her Majesty in the photo above, and if the year isn’t immediately obvious from the computer terminal she’s typing on — or from her attire — you can find it on the wall, just to her left, printed on one of the signs trumpeting the arrival of the ARPANET.